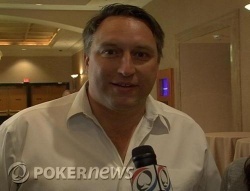 PokerNews grabbed Erick Lindgren and Gavin Smith just after their friend Bill Edler’s bracelet win. The guys talked about Bill’s win and also their much publicized INSANE golf bet in which Lindgren had to … well, watch the video to find out. Click here to hear about the golf bet. Click here to check out the interview with Bill, along with all the other videos from this event. Congrats to Bill Edler for winning his first WSOP bracelet. He also won $904,672 for first place. "That's what I love about poker," said Edler. "It's a about making tough decisions and getting a little luck." When asked about how he's feeling moment after his victory, Edler said, "I'm way more excited than I expected to be after winning a bracelet. Playing tournament poker for a living is tough. It's a lot of long hours of a grind. And losing and losing. But this is great." This is indeed a special moment at the 2007 WSOP since Bill Edler is considered one of the nicest guys on the tournament circuit. Congrats to Bill Edler on a job well done. Bill Edler raised and Alex Bolotin quickly moved all in. Edler went into the tank for a few minutes before he called. The flop was and Edler took the lead. The turn was the and the river was the . Bill Edler won the pot and knocked out Alex Bolotin in second place. Bolotin won $504,686 for his efforts. 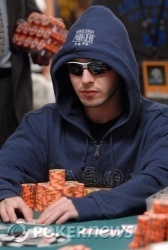 Over the last couple of weeks, Bolotin has proven that he's a tough and gritty player after making two final tables at the 2007 WSOP. 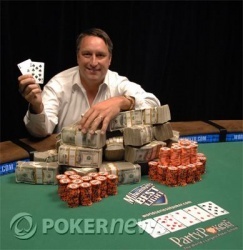 Bill Edler won the majority of the first ten hands of heads-up play. He's been applying the pressure and increased his stack to 5.3M. Both players limped. The flop was . Bill Edler bet the pot and Bolotin called. The turn was the and both players checked. The river was the . Edler fired out 450K and Bolotin called. Edler showed for a full house and Bolotin mucked his hand. Edler increased his stack to over 4.7M. Edler raised and Bolotin folded.